Contact us now for support and advice on installation, and TV fitment. Prefer to chat rather than call or email? Contact us via live chat. Question you have not answered here in our FAQ? Please ask us: No question to big or small. If you have reached this page, then you likely have some questions that have not been answered. Please drop us a line if you don’t find the information you need here. One of our friendly team members will be happy to help you further. The team at SealTV have put together their Top 10 tips for installing a TV outdoors. This helpful guide will get you started in the right direction from the start. Check it out now. Does it fit my TV? Your TV is protected from the elements inside a weatherproof lockable case that keeps the rain, dirt and debris out of your TV. The enclosure is pre-wired so you plug your TV into the enclosure, and away you go. The enclosure’s intelligent sensor system monitors the temperature inside the case and turns fans on and off as required, to keep your TV working at the correct operating temperature. This extends the life of your TV. Lastly a locking system keeps the TV safe from theft and vandalism. Check out the explainer video here for more detail. Why buy a SealTV outdoor TV enclosure? We have designed our enclosures from the ground up to be the most affordable solution to installing a television or digital display outside, and we have done it without sacrificing quality. In fact our enclosures have more features than our international competitors and we still beat them on price. Designing and developing enclosures is all we do, so we have gotten very good at it. We supply a heavy duty VESA mount to secure the enclosure to your wall. Our mount is galvanised and powder coated so it's suitable for installation outdoors. The mount is rated to carry both the weight of the enclousre and a standard television inside. Does it need to be installed under cover? No, it doesn’t need to be installed under cover as the enclosure is weatherproof. However, we always recommend installing in a location that gets shade, so you don’t have to contend with glare from the sun. Can it take direct sunlight? The enclosure itself has no problems being installed under direct sunlight. However we do not recommend this for a couple of reasons. Unless you keep the enclosure powered up 24/7 (to allow it to cool your television even when it is not on) the TV inside may overheat in direct sun. The liquid crystals inside an LCD panel can solidify under direct sunlight, causing the panel to darken as the liquid solidifies. Glare caused by the sun can reflect off the TV and enclosure detracting from your viewing experience. For these reasons, you should install your TV and enclosure in a position where it faces away from the sun for as much as possible, or at least for the times of the day that you most likely will be watching it. How does it block out rain? Our patent pending design, utilizes a double seal system, making it impossible for water to enter the enclosure. Should the first seal fail, the water would need to both literally defy gravity just to get to the second seal, let alone breach it. Yes, SealTV television and display enclosures are rated IP56 for ingression protection. IP56 is defined as limited ingress of dust permitted (no harmful deposit) and protected against strong jets of water. Limited ingress permitted. Do you offer IP65 rated enclosures (completely sealed and dust-proof)? We can custom manufacture IP65 (Totally protected against the ingress of dust and protected against jets of water) rated enclosures. Please contact us with your requirements and we design and build a suitable solution. What happens if someone tries to break into the enclosure and steal the TV? Your TV is locked inside a steel enclosure with a safety glass exterior. The access door of the enclosure is secured via twin security locks. How tough is it? Is the TV protected from impact? We use shock-resistant (toughened) safety glass or polycarbonate sheets for the viewing area. Poly carbonate is recommended for installations where vandalism could be an issue, as it has very high impact resistance and is near un-breakable. What is the enclosure made from? The enclosure is made from galvanized mild steel. The gal protects the steel from corrosion. We then powder-coat the enclosure to protect it further from the elements. Is it made from plastic? Is the case plastic? No, our enclosures are galvanized and powder coated steel. Other enclosures are made from plastic. Under the Australian sun, even UV resistant plastic quickly becomes brittle. We tested plastic enclosures but found them to be less efficient in transferring heat away from the television. The thermodynamic properties of the steel enclosure allow it to transfer heat away from the TV as efficiently as possible. How long will your enclosure last outdoors? The enclosure is built to last a very long time. We anticipate you will be replacing your TV before you replace the enclosure. Yes, we offer a 12 month manufacturers warranty. Wipe it down to remove the dust periodically. You shouldn’t have to clean it more than 4-6 times per year. We recommend a damp cloth from a bucket with warm, soapy water only. What cleaning products can I use on it? We recommend you only use warm soapy water to wash the enclosure. Do not use cleaning products containing chemicals such as ammonia. If you hose the enclosure take care not to point the stream of water up through the air vents. How do I connect the TV up to Foxtel, AppleTV, DVD player or other input sources? A weatherproof outlet or "cable pass-through" system, lets you pass cables from the outside of the enclosure, through to the inside where you can connect it up to the TV. Yes, you will need to provide the TV enclosure power. Plug the enclosure in to your power point, and In turn, the enclosure then passes the power onto the TV. Inside the enclosure is a surge protected power board that you plug your TV into, as well as anything else you want to keep inside the enclosure (Apple TV, HD player etc.). Like anything electrical you should always connect it to a circuit with a safety switch installed. Is it safe? Can't I get an electric shock if it's made out of steel? The enclosure is very safe. It's power is wired through a surge protected power board. We earth the entire enclosure to ensure as well. Inside the enclosure you will find the earth point marked, as well as an electrical junction box. Both of these have labels which indicate not to unscrew or open. Please do not unscrew or open these under any circumstances. There are no serviceable parts inside. How do I know what size enclosure to buy? We have a range of enclosure models in different sizes, to suit the size of your TV. Why don’t I just put a regular TV outside and if it blows up what the hell!? Clients who have done this have reported to us that they end up going through about 3-4 TVs per year, so the costs can quickly add up. From a safety perspective having a 110/240V electrical device exposed to moisture/condensation and dust is very risky and could endanger your family and friends. In the end, at the prices we offer, the risk is just not worth it. The SealTV range of enclosures are designed and engineered in Australia, before being manufactured and assembled offshore. We do this to keep the prices as low as possible. Our China based factory is run by our own production team, to ensure quality and delivery to standards. What about the sound? Is it affected? The enclosures does reduce the volume of the televisions' sound. We offer an external speaker and amplifier kit to amplify the sound. Let us know if you are interested in this option. Will it affect the picture quality of my TV? No. The enclosure is built with a cable pass-through system, which lets you connect your aerial to the TV, as you would normally. There is no signal interference that would impact the picture quality. What does the enclosure do exactly? Your TV is protected from the elements inside a weatherproof lockable case that keeps the rain, dirt and debris out of your TV. The enclosure is pre-wired so you plug your TV into the enclosure, and away you go. Lastly, a locking system keeps the TV safe from theft and vandalism. Check out the explainer video here for more detail. Does it work in hot and cold weather? Yes, our enclosures are designed to work in wide temperature ranges, whilst always keeping the TV inside within the correct operating temperature range as recommended by television manufacturer's. How does it stop the TV from overheating outdoors? The fans extract hot air from the enclosure and pull cool air inside. The fans will adjust their speed and flow capacity depending on the internal temperature of the air inside the case. It’s reasonably simple to install. The enclosure is sort-of like a big TV mount that happens to enclose your TV in a weatherproof cover, so if you can wall mount a TV, you should have no problems installing. To make things easier, a fully illustrated installation guide gives you step by step instructions to install. You should also check out the installation video. Our TV enclosures are plug-and-play. We have pre-wired everything so you don't need a licensed electrician to wire it up. Other enclosures on the market are only partially wired, requiring an electrician to finalise the install. You don't have to be super technical to install one. If you can wall mount a TV, you will be able to install our enclosures. In the box, you will find a fully illustrated installation guide gives you step by step instructions to install. We also offer an installation video to give you get you going. No we don’t offer installation services, however if you are in the Sydney metro area, we can recommend some great installers to give you a quote. Pricing varies depending on the size of enclosure you are after. Check out pricing here. If you are an AV Integrator or Installer and you are interested in offering our range of enclosures to your customers, please contact us via this enquiry form to open a trade account. At the moment we sell direct. Please enquire here or shop online here. If you are a retailer and are interested in offering our range to your customers please fill out this quick application form to get started. If you own a business and are interested in opening an account with us, please contact us. Please be aware all accounts are cash only. In order to keep prices as low as possible we do not extend credit or provide post-delivery payment terms. IPayments online are processed via securely vie eWay, a leading payment provider. We do not store your credit card information at any time. What if I’m an installer or AV guy, what is my cost? If you are a professional installer or retailer and are interested in offering our enclosures to your clients, or using them in a project please contact us for a quote. We offer a refund within 7 days of purchasing, as long as the item is returned completely un-opened, and undamaged, and returned to us within 7 days. We do not refund shipping expenses. A re-stocking fee of 15% will be charged. Installing our enclosures is made simple with a comprehensive illustrated installation guide. We also provide an installation video to guide you through step by step, and if all else fails contact us for additional assistance! To ensure high levels of customer support, and constant improvement, we log every case and issue lodged by our customers. 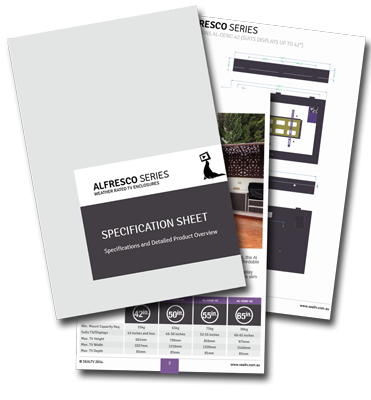 Our downloadable information packs give you all the information you need to understand the benefits, features and specifications of our range of enclosures.Just follow the link above. Call us on 1300 938 887 and we will happily answer your questions, provide advice or information.